The Charles Darwin University (CDU) SIFE team recently competed in the National SIFE Australia competition held in Brisbane from July 6 to 9. SIFE (Students in Free Enterprise) is a prestigious award which challenges university students to make a difference in their communities and to develop their leadership, teamwork and communication skills through learning, practicing and teaching the principles of free enterprise. The use of community radio to promote health and well being with a view to generating an anti-obesity/anti intoxicant/anti violence culture and as such generate huge long term health savings for the NT community. The CDU team competed against 22 other universities. The event was won this year by the University of South Australia who will represent Australia in the world championship in Paris. In this year’s event the CDU team was the ‘rookies rooky’ however it served as an excellent reconnaissance platform for next year and the team is keen to expand its numbers and support base, particularly in business and IT. Laura Duffield, CDU SIFE President, said, “Personally, I feel empowered and motivated to share the skills I learnt from other SIFE teams. There is so much that can be developed within our community, it just needs a little human resource to link it all together. We were very proud and privileged to represent CDU and be part of this important community inspiration. “SIFE has taught me that I can make a difference, but most importantly, SIFE has inspired me to make a difference,” said Laura. Dan Baschiera, the SIFE team’s lecturer, said, “The work-based/service learning approach will now be incorporated in the newly accredited social work degree in 2007 where the community development learning generated by the SIFE competition will be embedded into the new community work course. “This type of ‘hands on’ training provides the student with both a ‘real life’ educational experience suited to the adult learner and a strong motivator in its actual ‘community help’ process,” said Dan. CDU staff and students who are interested in SIFE are invited to meet the SIFE team, see their presentation and discuss their feedback on Thursday 3 August from 3pm to 4pm in room 23.01 at Casuarina Campus. A work-based learning seminar by visiting fellow Frank Lyons will also be held the day before, on Wednesday 2 August in room 31.3.03 at Casuarina Campus. For more information contact Linda Cuttriss, coordinator, Community Engagement, on 08 8946 6336 or linda.cuttriss@cdu.edu.au. 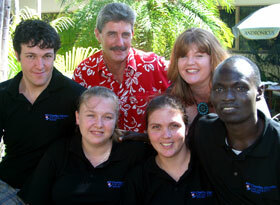 Or visit http://www.sifeaustralia.org.au or http://www.sife.org. By Dan Baschiera, edited by Linda Cuttriss.